Chop the figs into small pieces. Take them in a microwave safe bowl and add 1 tblsp of water to it. Microwave at high for exactly 1 min and keep it aside. This will make the fruit soft and perfect for the cake. Sieve maida, baking powder and salt together and keep it aside. Take a dry pan and add the sugar to it. Leave it untouched for few mins until it melts completely and starts to bubble. Simmer the stove and add the water to it and stir quickly. Allow it to cook in low flame until it becomes slightly thick. Transfer it to another bowl immediately and allow it to cool before use. You can store this is refrigerator for a long time. Take a beating bowl and chop in the butter into small chunks. Gradually add sugar to it and beat until light and fluffy. Now add one egg at a time and beat well. Once done, add the caramel and lemon juice to it and mix well. Now fold in the sieved flour mixture gently. Finally add the cooked figs to it and give one stir to spread it evenly. Preheat oven to 350°F or 180°C. Grease the mould with butter and dust with maida. Fill the moulds with batter upto 3/4th and bake it for 20-25 mins at 180°C. Adjust the time according to your oven settings. Check if cooked by inserting a skewer in the center. Once done, allow it to cool on a wire rack for a while. Cooking the dry figs is an important step. Adding it directly might make the fruit harder and unpleasant to chew. You can replace dried figs with fresh figs and skip the cooking part. You can also use dates and nuts along with this. 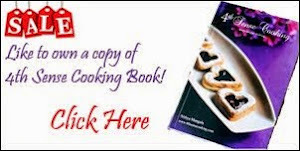 Follow the same cooking procedure for dates too. You can replace caramel with vanilla as a variation. 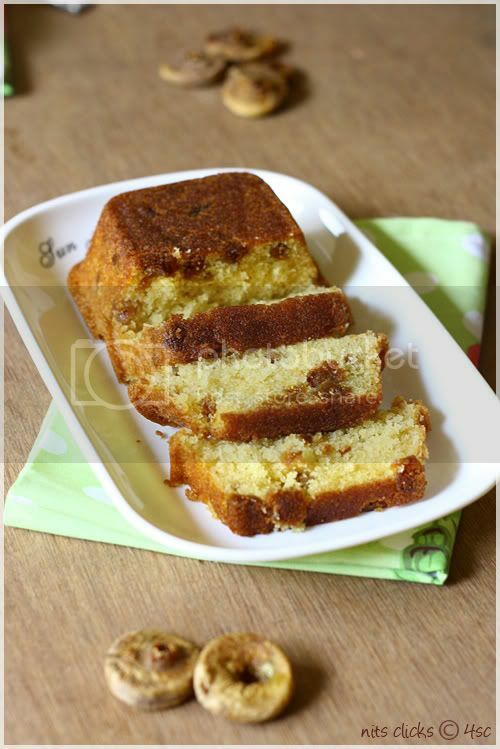 You can add spices like cinnamon and cardamom to this cake as well. I used the disposable aluminium packaging bowls for baking my loafs this time :) This one is simple to use and does not need greasing and dusting too :) Various sizes and shapes are easily available too. Place them on a cookie tray and then place it on your grill. 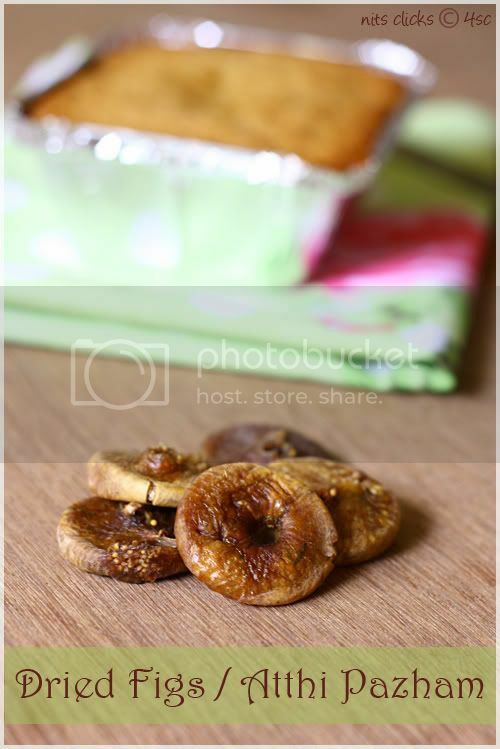 Wow that is too good.Never heared a cake in dried figs.Great work.Send a piece of cake to me na hehehehe. Figs are filled with so much goodness. making a loaf of it is truly wonderful idea. Clicks are great Nithya. Beautiful texture and the cake looks soft and delicious! 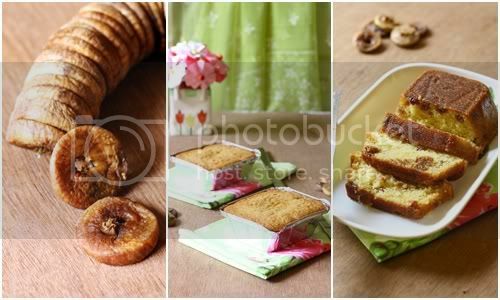 love the slices..last time, I got a packet of dried figs from India too ..I made a eggless version..do check when you find time.. Wonderful recipe....cake looks so soft and delicious. Just two words "delicious, healthy"! 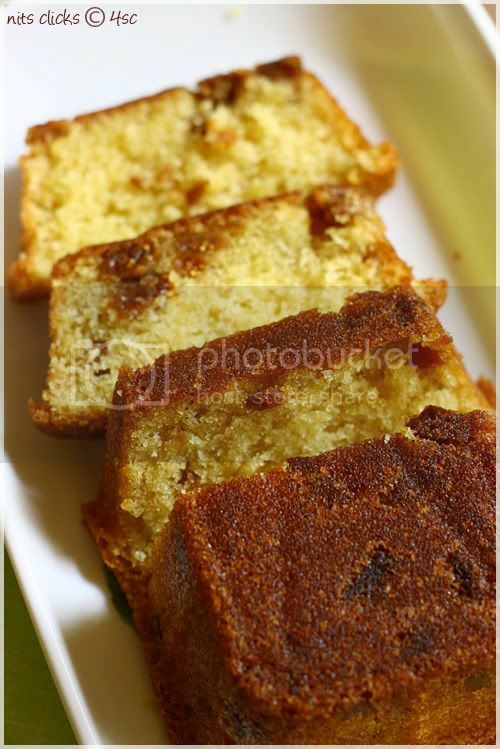 Cake looks damn pretty spongy and incredible,lovely loaf..
what a delightful combo....excuisite photography! Delicious fig loaf, looks like caramel go well with fig. Love it that you've baked it in the disposable aluminium pans.have always wondered how it will turn out.This sounds perfect as a gift no,*hint hint*,ha,just kidding.The loaf looks pretty with those crunchy figs..yum! 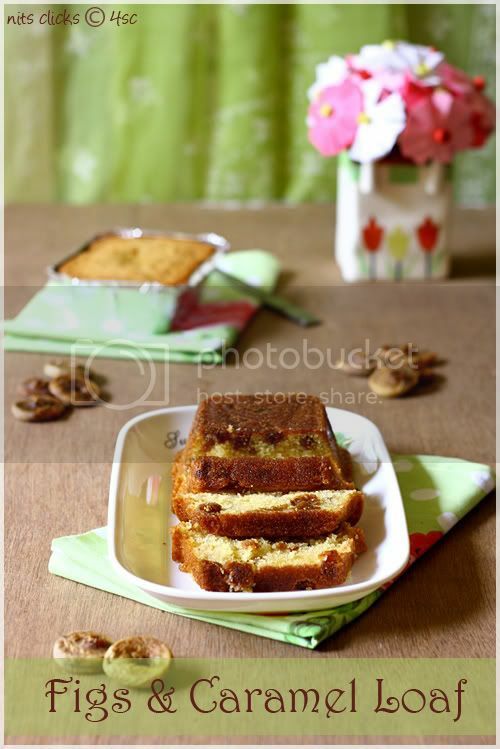 Wow that a yummy combo,loaf luks so perfect...Cute clicks. Figs are my fav. 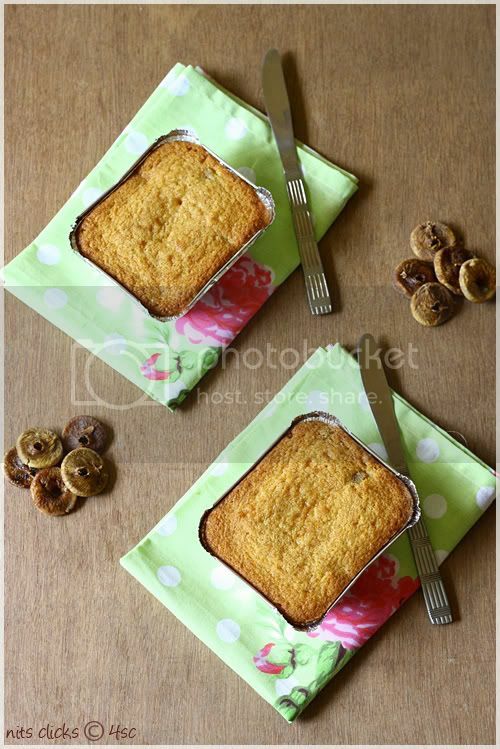 A cake with figs..would love to taste it Niths. What a coincidence that u too baked a pound cake. Baked it sometime back but was waiting for the Sweet Punch reveal date. Loved the texture of your cake. And I just don't get tired commenting on your marvelous snaps!!!! :) Too good. Wow! that looks mouthwatering and the clicks are beautiful! Love every pic of urs. You have an artistic way of clicking pics which I admire. Great post!! I have never tried figs in loaf; now I am curious! Hi..,just out of the world loaf,my house was filled with awesome aroma.. just wondering.. can i substitute eggs with something here?? Hi just wondering.. cn i substitute eggs here? thanks for the wonderful recipe,it was truely delicious! Wonderful!! !Nithya, cake looks softy, softy. 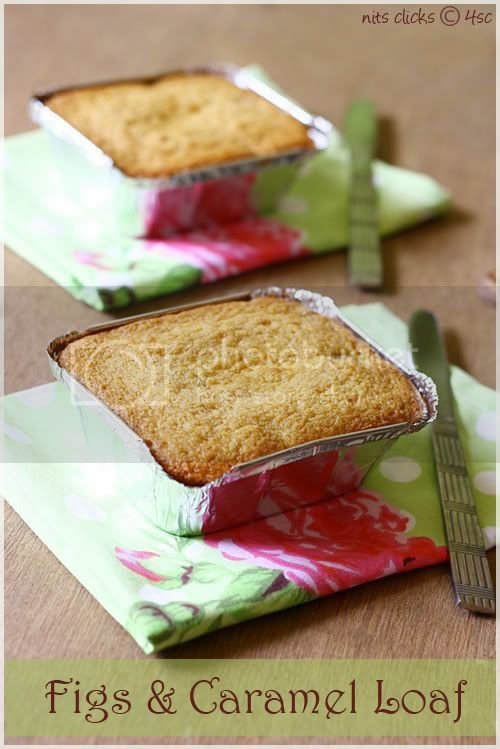 Can we use those aluminium trays in microwave to bake cakes?